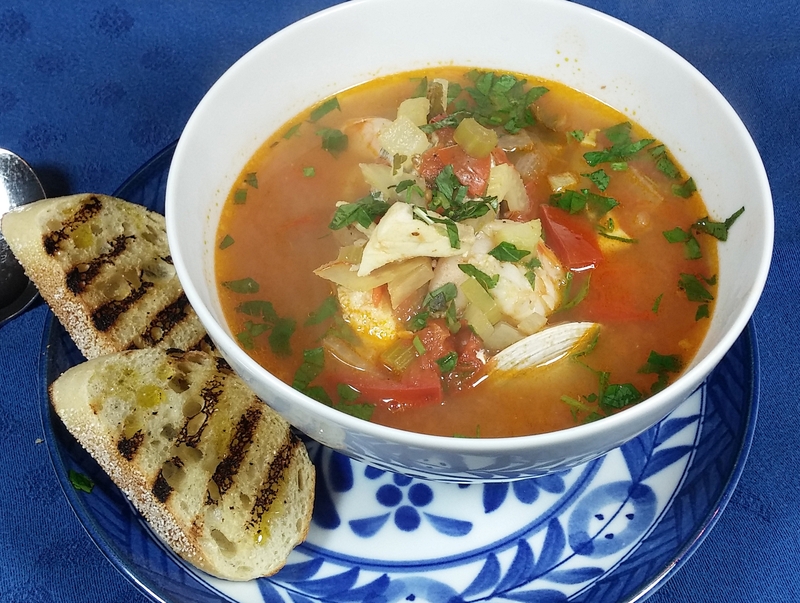 Bouillabaisse is a traditional Provencal seafood stew that is made with at least 3 kinds of fish and flavored with saffron and traditional Provencal flavors like fennel, tomato, bay, thyme and tarragon. Traditionally, the soup is served with rouille, a mayonnaise made of olive oil, garlic, saffron and cayenne pepper on grilled bread. My bouillabaisse is not a traditional version, but it does contain the traditional flavors. I like to make this with leftover scraps of fish that I keep in my freezer when I buy a piece of fish to cut into fillets. I usually have some halibut pieces and shrimp in the freezer, which is enough to make this dish (though it doesn’t meet the traditional rule of three types of seafood). I also like to add clams, mussels or calamari to the stew. I skip the rouille, and serve this with simple grilled bread rubbed with garlic and drizzled with olive oil.